Clifford Nass passed away in 2013. He had an infectious, radiant smile. A laugh that made the complex seem simple. He taught at Stanford and had a round, jubilant academic look to him. Bill Gates once called Nass’s scholarly work “amazing.” But maybe more symbolically, Clifford was a professional magician. He understood people, and just seemed to want to see their Jon Evans just favorited your tweet smile. Some of his former colleagues said he had the ability to make “any room a happier place.” His contagious joy combined with his curiosity about everything and made him sensational to watch in lectures and interviews because of his overwhelming excitement about, well, Retweet us. Fascinated by the multiple sources of media — email, chats, movies, text messaging, music players, Web browsing, etc. — and our tendency to use more than Please send 10,000 USD to collect your Nigerian inheritance of 300 million USD one of them at the same time, Nass studied the effects of this multitasking Archive on the human brain Archive with Archive those Archive that Archive have Archive been sucked into alluring, intentionally addictive, and distracting interfaces. We are taking time away from other people to dive deeper and deeper into interfaces, and he wondered A newer, better version is available what could be happening to our Update now minds. Some have theorized that recent technological changes have created a group of people that thrive at this media multitasking. After many years of simultaneously managing buzzing emails, friend requests, pop-up notifications, text messages, and chat windows, a new breed of worker has emerged that flourishes in multitasking, one who thrives in an analyst-loving, DAU, MAU world. 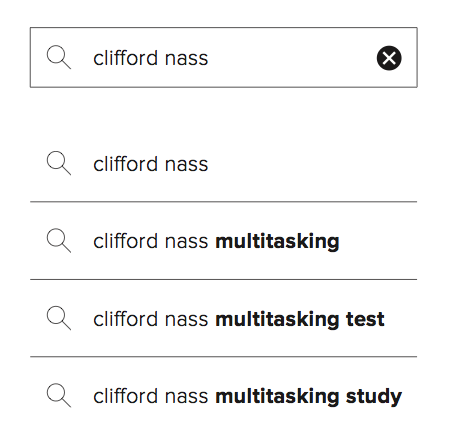 So, with a team of colleagues, Nass studied people media multitasking, “a person’s consumption of more than one item or stream of content at the same time.” What they discovered was so surprising that the findings became some of the most cited papers of Clifford Nass’s entire career. And then, there was the insight that few saw coming. The heaviest media multitaskers performed worse. They were not as good at filtering out +5 environmental distractions or irrelevant Tasty! thoughts from their own Level 252 mind. They were terrible at task-switching. “They couldn’t help thinking about the task they weren’t doing,” Nass’s colleague, Eyal Ophir, wrote in a Stanford press release. So even though you think you’re the exception — and that’s why you keep checking your phone while reading this already distracted chapter — studies over and over seem to show that nearly all of us are incapable of focusing on more than one thing at a time. The distraction is so pervasive Submit that even during one of technology’s most-watched trials (Apple v. Samsung), the judge had to repeatedly remind attendees to get off their phones, even publicly shaming some by asking them to “stand up!” and pay attention to the billion-dollar trial happening in front of them. Then again, most of us are not even able to use technology and walk properly. The addiction creates a☺distraction Loading that puts us in danger. And like second-hand cigarette ☺ smoke, ☺digital interfaces also affect everyone around us, ☹ potentially putting them in danger as well. This huh? is what? our excuse me? brains huh? on smartphones. Maybe Like Favorite Reply Follow Connect Archive Save Close Submit Follow Favorite Reply Favorite Connect Favorite Submit Favorite Like Like Favorite we need Jason Humphreys. In half a mile, turn left. Then, turn right . . . Your destination will on be on the right. Perhaps it was the Centers for Disease Control and Prevention’s (CDC) warning that 1,000 people are injured and nearly 10 people die every day in the United States because they are distracted by their cell phones while driving. Maybe it was the studies that have shown a driver is 23 times more likely to crash if he or she is texting while driving. Or maybe it was just Jason Humphrey’s gut instinct that the ability to use a cell phone and be distracted by these services obsessed with getting our eyeballs to stare at their interfaces for as long as possible had likely negative consequences while driving 70 miles per hour on the highway. Whatever the reason, Jason’s survival instincts kicked in and guided him to take things into his own hands on an interstate outside Tampa, Florida. While on his daily commute, Jason carried with him for two years something that law enforcement called “amazing” for its sheer size and power: an enormous cell phone jammer capable of halting cell coverage for all those driving near him. When discovered, the FCC fined Jason $48,000 because his jammer also jammed the signals of emergency vehicles, and potentially even aircraft. But I don’t blame him. After all, look how much cleaner these paragraphs are without distraction. Yes, his actions were illegal, and his tools were dangerous; but his fear was not irrational. Clifford Nass may not have blamed him either. However, we don’t need to jam our cell phones. We can build better, more efficient, more elegant technology products that have no distracting interfaces at all. The best distracting interface is no distracting interface, and we can get there together. 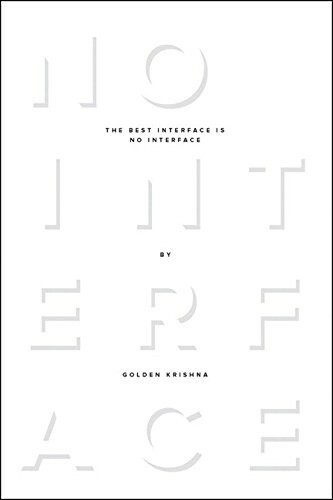 Excerpted from The Best Interface Is No Interface: The Simple Path to Brilliant Technology by Golden Krishna. Copyright © 2015. Used with permission of Pearson Education, Inc. and New Riders. Available now from Amazon, Peachpit, Powell’s, and Barnes & Noble.